At LEADPrep we strive to remain on the cutting edge of teaching/learning techniques. We work hard to maintain a strong awareness of the best of the best in regards to how we teach, how our students learn, and how we prepare our students for the world at large. One of our techniques is called project-based learning. What exactly does that mean? Couldn’t much school work be considered project-based? 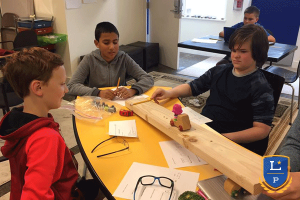 There are a number of specific components necessary to create true project-based learning. First, the students themselves have to design the project. The project isn’t a step by step plan provided by their teacher. The students themselves, with guidance, create a project that fulfills the requirements set by the teachers. Second, the students plan every aspect of the project. What math, technology, art, science, or engineering skills or knowledge must they have to complete the project? Whose help will they need? Where will they find the materials? What research must they do before they start? Teachers provide support while students explore exactly what must happen between the idea and the result. Next, the students have to get down to brass tacks and DO what they have planned. They need to get every piece of the project together and do what needs to be done to get the project completed. Guidance from their teachers is vital, as you might imagine. Guidance that allows them to discover their mistakes along the way, devise a way to fix what went wrong, and support and encouragement to move forward toward completion. Finally, the outcome – whether it is a product, publication, or presentation – must be publicly exhibited. The public exhibition can be to their peers, the school as a whole, or to an audience outside the school itself. Students must show a greater audience than just their teacher what they have created and exhibit what they have learned along the way. These skills translate directly into project management in the workforce. Relevant learning AND design-thinking combined!